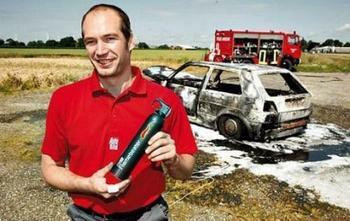 Is your car equipped with a fire extinguisher? Every summer, "spontaneous combustion" will become a high-frequency word. Some car owners missed a good opportunity for rescue because they did not have fire extinguishers. It is understood that the Nanjing Vehicle Administration Department does not impose a fire extinguisher on domestic cars. However, many people are equipped with fire extinguishers. An interview with the reporter found that although many owners had fire extinguishers, they did not pay attention after they were assigned. Some fire extinguishers have already expired in the car. Fire extinguisher use instructions 1. Remove the fire extinguisher and remove the seal of the safety pin. 2. Remove the safety pin. 3. Open the cabin cover with a small gap. 4. Spray dry powder into the cabin from the gap to reduce the fire. Many car owners consciously equipped with fire extinguishers "fire extinguishers to buy their own, or direct delivery?" Yesterday afternoon, the Modern Express reporter went to a 4S shop on Daming Road, heard a car buyer is consulting sales personnel. The sales staff introduced that if the car purchaser asked the 4S shop to help the card, the five or six hundred "package" contained a fire extinguisher. Sales staff said that if guests do not want to be in the store, they must buy their own fire extinguishers. "A fire extinguisher costs seventy to eighty yuan. We are not likely to send it directly." The salesman said, "Everyone will buy it. After all, it is for their own safety." â€œThere are almost all fire extinguishers on the cards that come to us here.â€ The staff on the Daming Road site stated that the fire extinguisher was a part of their inspection of the appearance of the vehicle, but it was not strong. If the owner had not yet, they would suggest buy one. "We also have to sell here." According to a person familiar with the Nanjing Automobile Administration Institute, at present, there is no compulsory domestic car in Nanjing that must be equipped with a fire extinguisher, but for a long time, whether it is on the card or the annual inspection, the staff will generally remind the owner of the importance of the fire extinguisher, but the owner eventually has no "Action", it depends on individuals. For some large vehicles, such as more than 9 buses, there are mandatory requirements. "Some vehicles require 4 fire extinguishers." Expired fire extinguishers must be remembered. Recently, media reports have reported that there is no fire extinguisher in private cars in Yancheng, and what is the situation in Nanjing? "I think this data is not reliable." An industry source said that although not mandatory, new cars are generally equipped with fire extinguishers. "In Nanjing, it must be said that 80% of the fire extinguishers can also be used for information." Although many people have fire extinguishers, these fire extinguishers often become "furniture." The reporter interviewed several drivers and most of them indicated that they did not use fire extinguishers and did not know how to use them. Miss Jinâ€™s car was bought two years ago. At the time, the 4S shop sent a fire extinguisher. She had been in the trunk and never took it out. In general, a fire extinguisher is valid for a year or so and her fire extinguisher is likely to have expired. "I haven't used it once. I'll change it. No need." There are a lot of car owners who have similar ideas with Miss Jin. Mr. Xu is an old driver, but never encountered a "big thing." Some time ago when he was cleaning the trunk, he discovered the fire extinguisher he had bought four years ago and felt that he would take up space and simply take home. However, he also said that the summer is the peak period of auto-ignition, he will consider buying a fire extinguisher. The relevant personnel of the Nanjing Vehicle Administration Office are skeptical about the statement that â€œ80% or more of Yanchengâ€™s private cars do not have a fire extinguisherâ€ but he also reminded private owners that they should not save the money. With fire extinguishers, we must also pay attention to the validity period, and do not use it when it is needed. UPE plastic,full name UHMWPE (ultra high molecular weight polyethylene) is a kind of thermoplastic engineering plastic with excellent properties of linear structure, with a molecular weight of more than 1.5 million.mainly have ESD UPE SHEET,CONDUCTIVE UPE. Small density, good wear resistance, self - lubricity, impact resistance, corrosion resistance and so on. 12.Outstanding machining property ,very low water absorption . Compared with other engineering plastics, UHMW-PE Plastic is resistant to heat resistance, stiffness and hardness, but can be improved by means of "filling" and "crosslinking". From the point ofheat resistance, the melting point of UHMW-PE Plastic is approximately the same (136 â„ƒ) and ordinary polyethylene, but because of its big molecular weight, melt viscosity high, so the processing difficulty is big. Papermaking industry : suction box boards ,scrapper,molding plate ,beating ,gear . Mining industry : charging barrel ,abrasive and adhensive -resistant back lining for warehouses. Chemical industry : acid pump ,fliter plate , worm gear ,bearing . Food industry :packing machinery parts ,bottle guide ,screw .wear plate ,slide away ,stud weld ,roller and other transmission parts. Specification: the thickness of UHMW-PE Plastic sheet material can be produced from 0.3mm to 1.9mm, the normal width is 600mm, the width can exceed 1200mm, and the length is not limited. The thickness of plate can be produced from 2mm to 180mm, the usual specification of 2-10mm is 600mm* 1200mm, and the commonly used specification of 10-180mm is 1200*3080mm. UHMW-PE Plastic can also be customized according to requirements, and the width cannot exceed 1200mm, and the length is not limited. Color: Black and white, can also be made another color, and the color order is 500KG. Modified varieties: UHMW-PE Plastic can be added to the Glass Fiber, copper powder, and molybdenum disulfide enhancement plate according to customer's requirements. Add antistatic agent to the permanent plate, the volume resistance value of 10 to the 6 to 9 power. Add flame retardant to the flame retardant board from UL 94v-0 to HB combustion grade, and other modification requirements are required to customize various additional properties according to the actual use of the customer. Product certification: most environmental certification reports and safety reports forraw materials, such as SGS report, CTI report, UL report, MSDS safety information, etc. Previous: How to quickly remove the oil on the kitchen tiles?